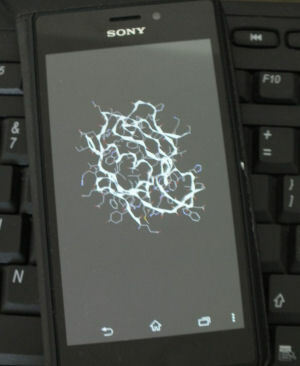 Mobile phones have enjoyed the recent advances in processing power and the Android platform supports a JVM (Java Virtual Machine) with OpenGL ES enabling the development of 3D applications: Zeus-Android has used this technology to offer Molecular Visualisation of Brookhaven Protein Databank files for Android devices. The desktop based Zeus molecular visualisation package had previously been ported to Java and OpenGL and has since formed the basis for Athena (Sparc64/x86 on Solaris). This most recent development sees an Android OpenGL-ES port of Zeus. 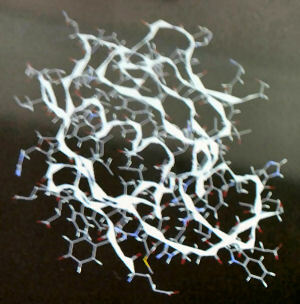 The first alpha version supports wire-frame rendering as well as 3D Bezier ribbons, computation of Hydrogens and Hydrogen bonding and CPK/colouring of residues by side-chain character (i.e. Acidic, Basic, Polar Uncharged, Non-polar). PDB files can also be downloaded automatically from the Protein Databank. Having developed in OpenGL with both Object Pascal and Java, it seemed a port of the Zeus code-base from Java-OpenGL would be fairly seamless. Whilst true for the Java classes and encapsulation of the molecular framework it was not the case for the graphics rendering as OpenGL ES (Embedded Systems) does not support glBegin/glEnd transactions and has no inherent support for GLUT (GL Utilities) and GLUT objects such as gluSphere or gluCylinder.